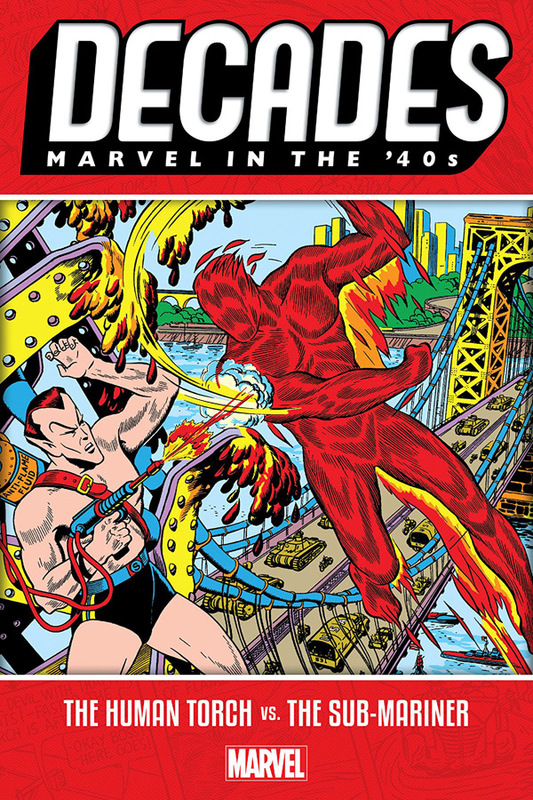 Celebrate 80 years of Marvel Comics, decade by decade — beginning with the first two superstars of the Flying Forties! The original Human Torch and Namor the Sub-Mariner get along as well as fire and water, and several of Timely’s greatest comics feature the twin titans clashing in fantastic feature-length fisticuffs! A rivalry for the ages is born when Namor, mistreated by the surface world, attacks New York — and the Torch stands in his way! As World War II rages, Namor decides to create peace by flooding the planet! Can the Torch and his young sidekick, Toro, bring Namor back to his senses? They’d better — because the Nazis are on the attack, and the Golden Age archrivals must put aside their differences aside and unite against a common foe! Collects Material from Marvel Mystery Comics #7-10 and Human Torch Comics #5B, #8 and #10.